An easy summer dessert that is festive and delicious. 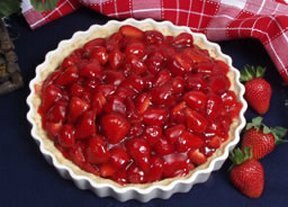 The crust is hand pressed into the pie plate, baked, and then filled to the top with delicious strawberries. A glaze is added and the pie is chilled. This is just one of the many luscious strawberry recipes we have for you to try this spring and summer. Would you like to preserve some of that delicious rhubarb? We have several easy methods you can use to freeze rhubarb. Our All About Asparagus guide will show you many great methods you can use for cooking asparagus.